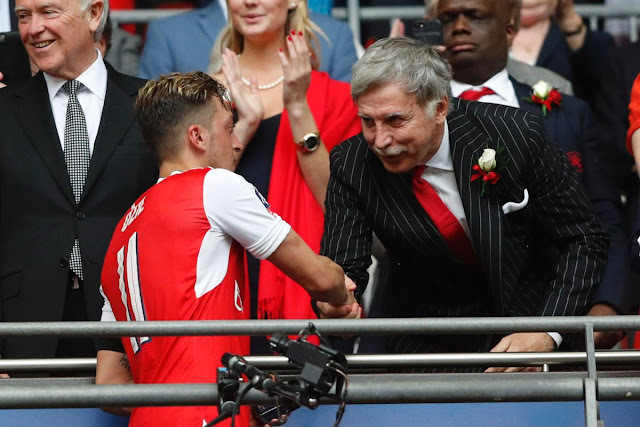 Arsenal's majority shareholder Stan Kroenke has made a £600m offer to buy the whole of the club in a deal that would value the Gunners at £1.8bn. A KSE statement to says taking the club private will help to further Arsenal's "strategy and ambitions". The statement to the stock exchange added: "KSE's ambitions for the club are to see it competing consistently to win the Premier League and the Champions League, as well as the major trophies in the women's senior game and at youth level." In the offer document, each of Arsenal's 62,217 shares are valued at at £29,419.64. KSE currently has 41,743 of those, with Usmanov holding a stake of 18,695, which would be worth £550m under the offer. Aquiring Usmanov's shares would move KSE past the 90% threshold whereby they could compulsorily be able to purchase the remaining 1,779 shares, which are valued at £52.3m. Apart from Arsenal, Kroenke's "family portfolio" of assets also include NFL side Los Angeles Rams, the NBA's Denver Nuggets, the NHL outfit Colorado Avalanche, MLS side Colorado Rapids and Colorado Mammoth of the National Lacrosse League.